What if I told you that YOU have the power to get your dog to listen to you more often? Does it sound too good to be true? It’s not, and, even better, it’s really easy! There are three helpful actions that are simple enough for everyone to use with their own dogs. Try for a month and you will see marked improvement when you ask your dog to listen and perform a behavior. It may feel like a waste of time to do this extra work if you have already taught your dog good manners. Why should you have to do more? The answer is that, like people, dogs do better when they receive a little more support, attention, and instruction. You could go along with a dog that “sort of, sometimes” listens, but why stop halfway? Especially when it’s so easy to take it to the next level—a level where your dog isn’t just listening to you but is happy to do what you ask! Plus, life is a whole lot easier when cooperation is the norm instead of the exception. Wouldn’t it be nice if your dog came the first time you called (and was wagging his tail the entire way)? Beats going out into the yard, chasing him around a bit, and being late for work, doesn’t it? The three steps to making training stick are all easy, dirt-cheap, quick, and effective. Let’s dive in! Make a list of the things your dog really likes. There is no need to spend much time on this; make your list on the back of an envelope or on your phone. It doesn’t matter where you write the list. The purpose of this quick exercise is to show you just how many things your dog enjoys. Look at all those different rewards I can offer my dog when he’s done something I’ve asked! Switching up rewards keeps your dog interested in what you’re asking, makes it fun for him to listen to you, and will greatly improve his manners. With the list you created for your dog, you are ready for huge variability in how you reward your dog for doing what you like. You are the gatekeeper to all the things your dog loves. Open the gate to those treats when your dog does what you like! Be generous! No one appreciates a stingy gift. It’s a beautiful cycle: you reward generously and unpredictably and your dog responds faster and with more enthusiasm. If your dog comes to you—no matter how long it took—reward generously with one (or two or three!) of the items on your list. I’ll bet that your dog will come even faster the next time you call him—and even faster the time after that! It’s a beautiful cycle: you reward generously and unpredictably and your dog responds faster and with more enthusiasm. It’s cool to see when your dog recognizes that listening to you opens up the door for him to have fun, get a goodie, or play a game with you. How many days a week do your kids spend practicing with their school sports teams? How many practice days do professional athletes put in before every game? In both cases, the answer is A LOT. We expect athletes to put in the practice time if they’re going to be star players, right? The same goes for your dog. Your dog will be as good as his practice; if he’s going to be a star, he needs practice time. What does this mean for you, his trainer? It means that right before you are going to give your dog something from the reward list you created, you’re going to ask him to do something for you. Using the come when called example again, maybe now you call your dog three times before you really need him to come in. Let’s say you’re getting ready for work and know that you have to leave the house at 7:30 am to be on time. Instead of calling your dog to come in at 7:25 am (when he’ll be “rewarded” by being crated and by your departure), call him at 7:10 am. When he comes to you, give him a tasty treat and send him back outside to play. Call him again at 7:15 am. Throw a squeaky toy for him and let him continue to play and explore the yard. At 7:20 am, call him again. This time, chase him for 15 seconds around the yard (if he loves to be chased, of course). Then at 7:25 am, the “for real, I need you to come right away” call, your dog gets a stuffed Kong inside the house (in his crate if you crate him during the day) as you leave. 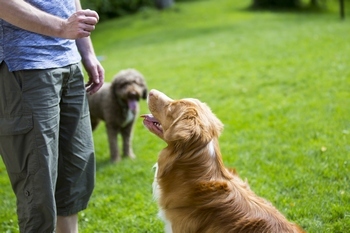 This sequence doesn’t take much extra time, but it does make a big impression on your dog! If you stick to this practice regimen (calling your dog when you can reward him and send him back out to play—another reward! ), before you know it your dog’s recall will be stellar! He’ll come to you the first time, every time! You’ll be amazed at how well you can make training stick! These three methods work independently. They work even better if you implement all three strategies together. It’s easy, cheap, and it’s effective. Start by making the list of the things your dog loves, then launch the program. You’ll be amazed at how well you can make training stick! Laurie Luck, KPA CTP, and a Karen Pryor Academy faculty member, is the founder of Smart Dog University. She has been involved with many pet dog trainer certification initiatives, all based on humane training practices and the latest scientific knowledge. Laurie also participates in service dog training, and she and her Tango are a pet-therapy team. Through her work with dogs and owners, Laurie has developed many happy canine and human friendships.